As a child, if someone would have asked me what my favorite books were, I would have said The Berenstain Bears. I remember my parents, grandparents, and various other adults reading to me. 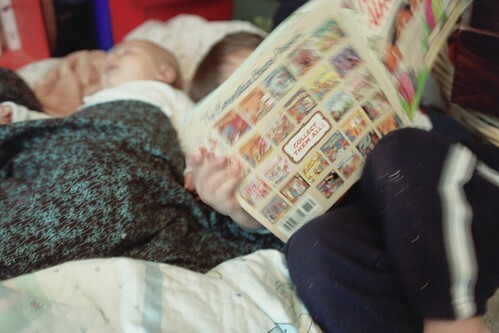 My sister, Katy, and I would go to the book store and travel straight the Berenstain Bears. We would pick one book up and look at all of the different titles on the back to see which ones we still needed. These books taught life lessons that I will always remember. I was very sad to hear about the passing of Jan Berenstain; however, she will live on through her writing. Thank you Stan and Jan Berenstain for countless hours of learning and entertainment!! Gilbert, Sarah. Berenstain Bears All Woozy. 2007. Flickr. Web. 28 Feb. 2012. Twitter can be a powerful tool in the classroom. One way to use Twitter is to set up a class or library account and follow professional authors. There are many Children’s and Young Adult authors that tweet on a regular basis (see list below), and many of them share how they are progressing on their current projects. Sometimes, they even tweet about the problems they encountering. One June day, Laurie Hales Anderson sent various tweets about her writing struggles. I’ve shown them to students to prove that writing isn’t easy, and it is a process. Writers also respond sometimes. I set up a Twitter account for my library. 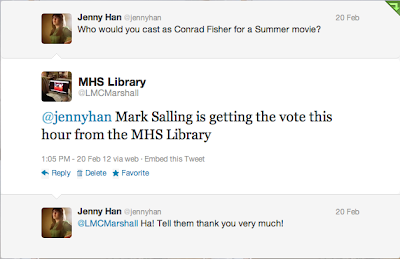 Today, Jenny Han, author of The Summer I Turned Pretty, asked her followers who should play Conrad in the movie. I asked the students in the library that hour. The students were so excited when Jenny tweeted back! Twitter allows classes to connect with the world outside of the four walls of their classroom or library. It can show students how others struggle with writing and make it through to the end. Also, the writers of the novels become more human. Twitter is a significant tool that can have a meaningful impact on students. Marshall Public Schools celebrated Digital Learning Day on Feb. 13, 2012 with a community Tech Fair. The District Technology Committee took the lead to organize this event, and many teachers from across the district volunteered their time to facilitate sessions. The goal was to show parents and the community how students are using technology to learn and what could happen with more technology in the hands of students. To draw more community members to the Tech Fair, the High School chapter of FCCLA hosted a Chili Supper and the PTA had a bake sale with the proceeds going to the technology fund. My favorite part was seeing the students share how they love technology and how they use it to help them learn. Ms. Price’s fourth graders were so proud of their digital valentines (pictured) and were excited to show their audience how to use QR Codes. It was also great to see parents use some of this technology for the first time. Many of our parents have never before seen an iPads in person, and this was their first opportunity to touch and use one. Kids were showing them how to use the apps that they use in the classroom. Below is the flyer that was sent to the community with the details of each session. Things I would do differently next year would be to have more digital promotion. I also would have the “Parents Play Area” have more focus with specific apps or activities rather than just letting them “play.” It needed to have more structure and supervision and was logistically challenging. The most successful was having students share their knowledge. This has the potential to become an annual event. I have a lot of hope that director Gary Ross is going to get things right. Thanks to Entertainment Weekly, my students and I have been closely following the production. EW did such a wonderful job featuring several articles about the process and interviews with the director that we high expectations. While this field trip is not tied to a specific curriculum, it embodies everything we want our students able to do in the real world. First, we want them to read for pleasure and for the adventure. Second, the paper asks for their analysis and expectations of the film maker’s interpretations. Third, after you read a book or see a movie, you should talk about it with others. 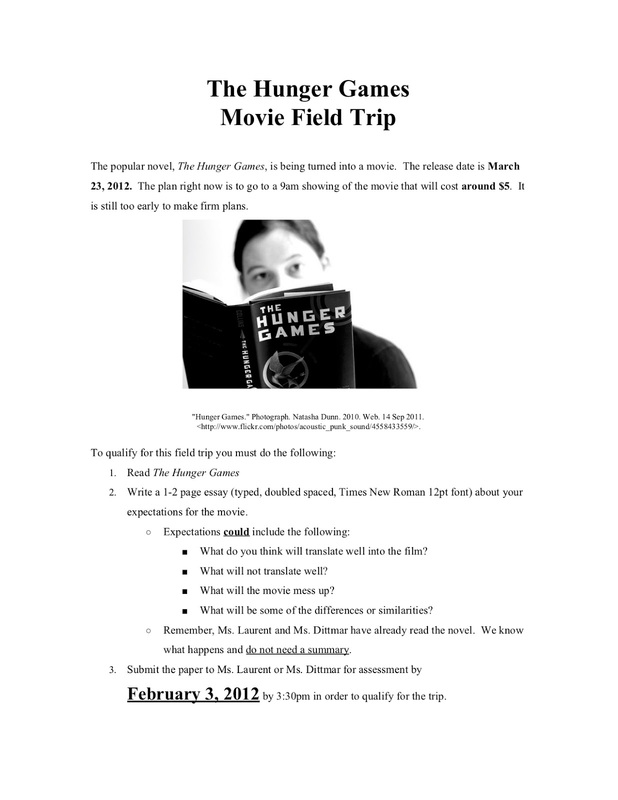 The students are excited, and I can’t wait to see their reactions and have the discussions. Like many librarians, teachers, and young adults across the nation, I enjoy The Hunger Games trilogy. It’s packed with adventure with just enough romance to keep a girl interested. It is incredibly easy to recommend these novels for any gender.